This article appeared on the website of the local PBS station, WUSF, which is affiliated with University of South Florida. It clearly reminds all of us why this amendment must be defeated--it simply not only cut offs any possibility of gay marriage coming into being, but also will challenge existing domestic partnerships in Florida. TAMPA (2008-10-30) Amendment 2's backers say it's about two things: defining marriage and prohibiting gay-marriage. However, the amendment's critics say it's about one thing: dismantling domestic partnerships. 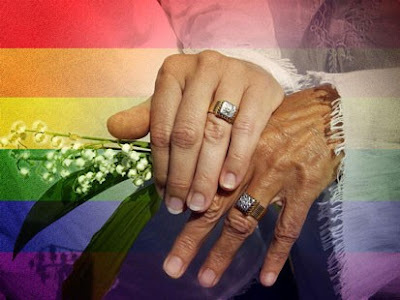 Currently, gay marriage is legal in two states, California and Massachusetts. On October 28th, Connecticut is set to become the third. That leaves 47 states where it is illegal. However, in many of those states, like Florida, there exist alternative legal relationships called domestic partnerships. They provide legal rights and benefits to those who cannot or choose not to marry. Amendment 2 reads as follows: "This amendment protects marriage as the legal union of only one man and one woman as husband and wife and provides that no other legal union that is treated as marriage or the substantial equivalent thereof shall be valid or recognized." It's that second clause... "no other legal union treated as marriage" or its "substantial equivalent," that some see as a veiled reference to domestic partnerships.